Date Night heads to the Highlands, North Highland that is, for our latest adventure. Located between Manuel’s and the group of buildings that house Fritti, Soto Soto and Pure Taqueria, is a small grouping of four restaurants that we have not tried. Tonight, we hit two of them. Our main destination is Folk Art, which is recommended to us by our work pals Sonya and Elizabeth. Due to an unexpected lack of traffic on this Friday, we arrive too early for dinner. What to do? Duck into the North Highland Pub for drinks, of course. The pub looks just like a neighborhood bar that has been there for years. You may have one near your house. From our table, we have a great view of the action. The guys next to us are drinking lots of Session Ale, which is $2 a bottle every day. That’s a good deal, but it’s not our cup of tea. We begin by studying the beer menu. There’s actually beer on both sides. We show you the menu because the first two beers that both of us order are not available. 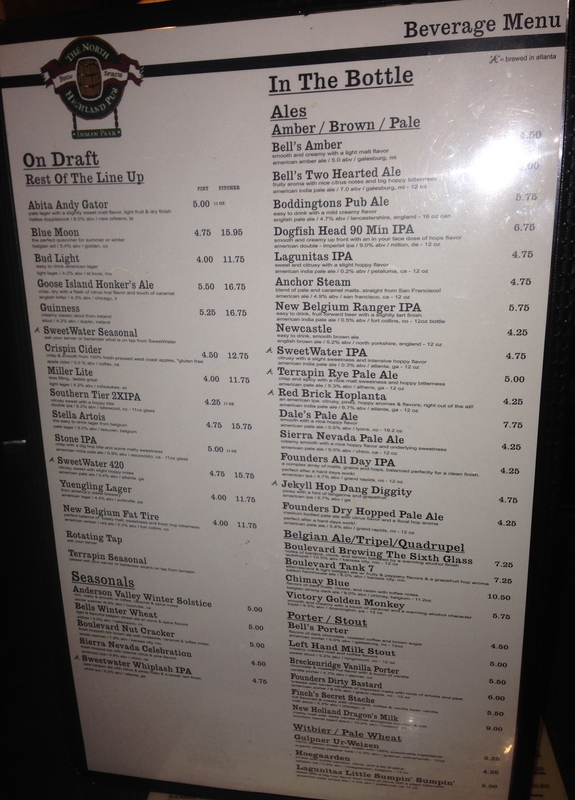 Why have a beer menu if you don’t have what’s on it? Someone isn’t doing their job behind the bar. We have to dig a little deeper to get something that we like. Christy, our charming server, is patient with us as we come up with “Plan B”, which actually is “Plan C” by now. 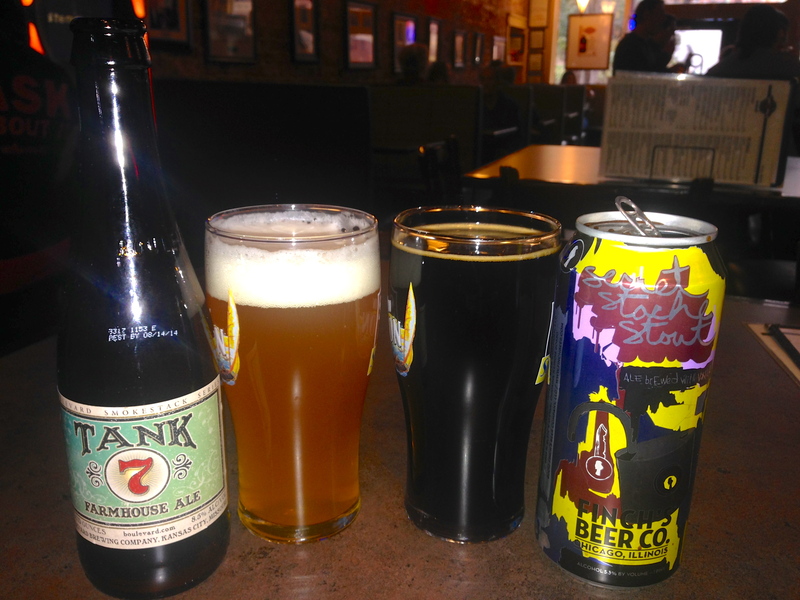 I go with the bottled Boulevard Tank 7 Saison and Eve chooses Finch’s Secret Stache Stout. The saison is hoppy at first, but it finishes on a citrus note. The Secret Stache is a good stout, with a strong taste of coffee. 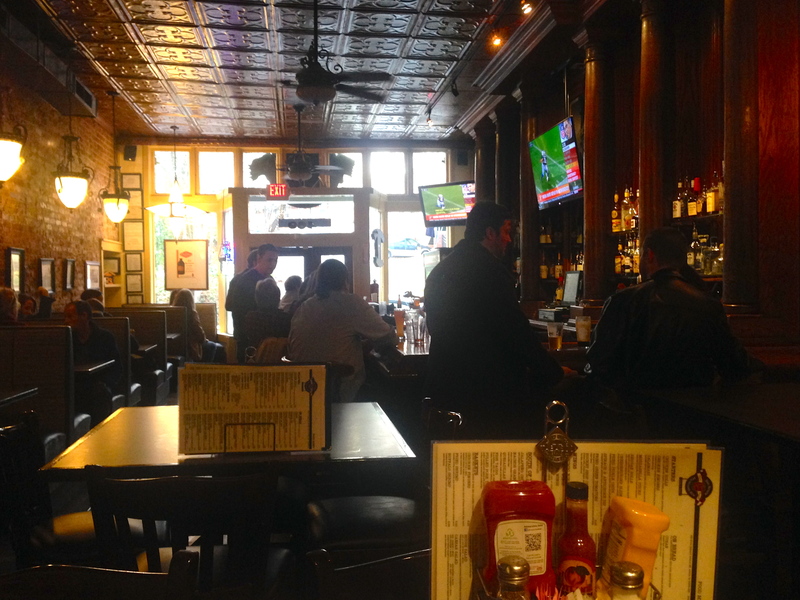 You can, of course eat at the North Highland Pub, and it’s mostly burgers and other pub-grub on the menu. We really could have used a soft pretzel with the beer, but it’s not on the menu. 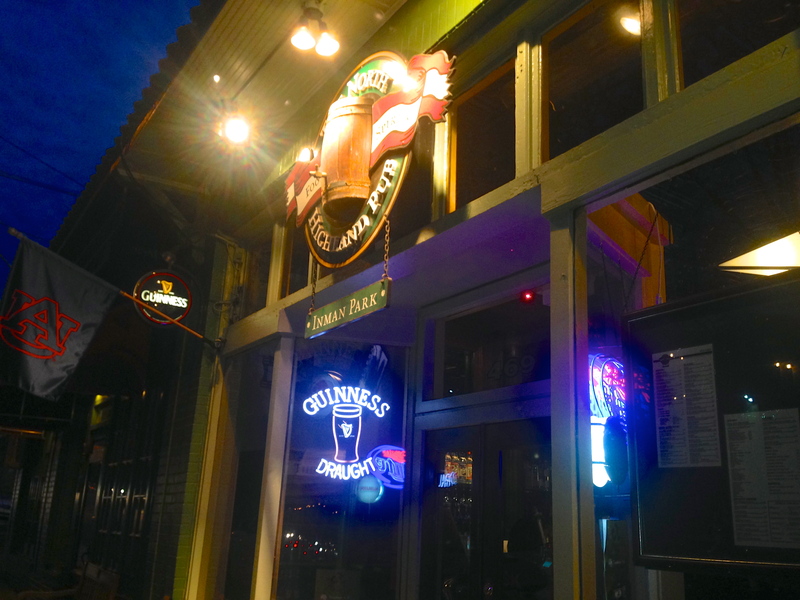 It’s a cool neighborhood bar, and best of all, there’s no smoking! Finished with our beers, we walk next door to Folk Art for the main event. They are owned by Wisteria, which is three doors down in this tiny complex. Wisteria has white tablecloths. Folk Art is much more casual and has a much more laid-back vibe. The above picture is a bit out of focus, and it makes everyone in it look much younger. 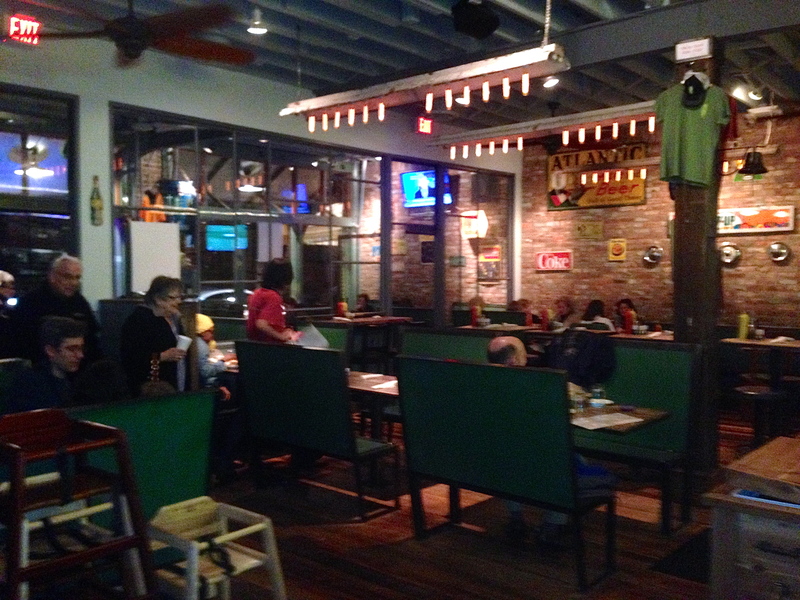 You can see the old stuff that’s up on the walls–hubcaps, signs, and old clocks. We’ve had beer next door and skip it here. The list is nice, and is organized by states, not the kind of beer. Anyway, bring on the appetizer. 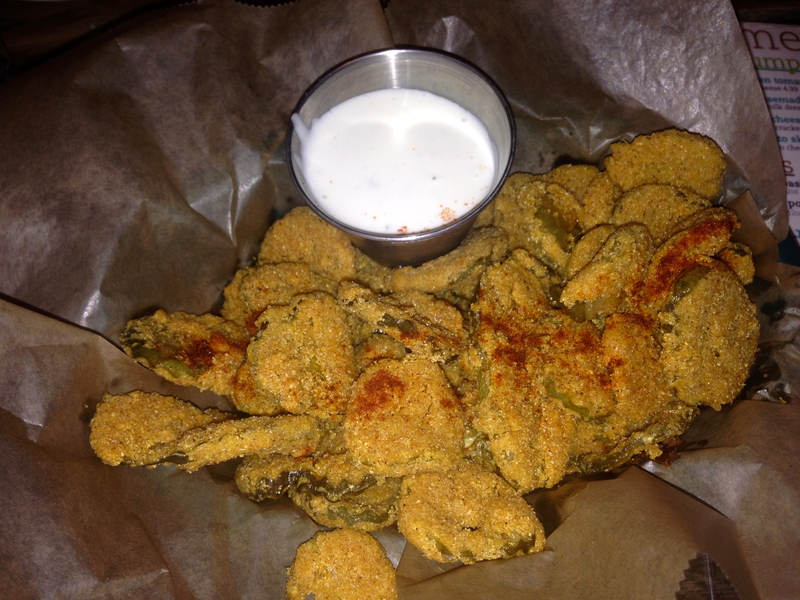 The fried pickles are hot, crunchy, sweet, salty and sour all at the same time. They have a little kick too. The ranch dipping sauce kills the heat a bit. This is a good start to our night. The menu has sandwiches, a few burgers, salads, some eggs and french toast dishes. It’s breakfast or lunch at dinner for us. We both order sandwiches, knowing that we are going to share, because that’s how we roll on Date Night. And we roll right into the lobster rolls. 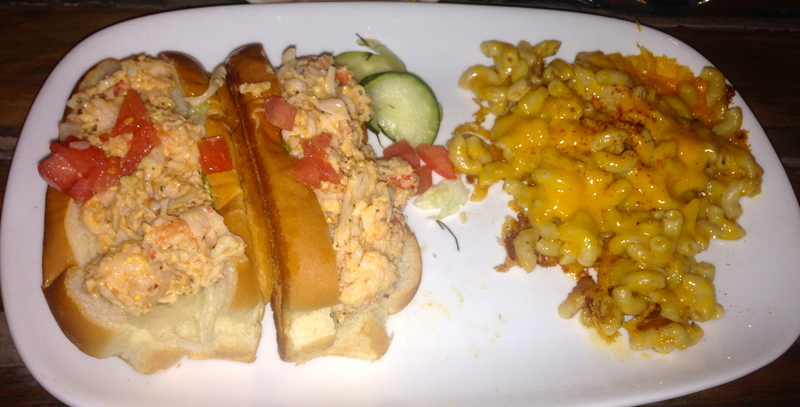 They are filled with a nice portion of cold, slightly-spicy lobster meat and served on buttery bread. The mac and cheese side is full of cheese and compliments our next sandwich. Say cheese! 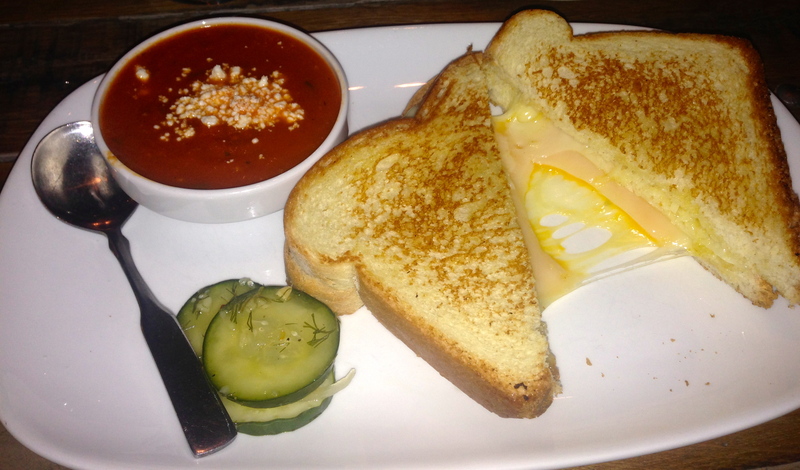 There are five of them in the grilled cheese sandwich: gruyere, cheddar, brie, provolone and swiss. The sandwich is hot, gooey, buttery and very enjoyable. It comes with a side of thick tomato soup, which tastes like tomato sauce. We don’t have room for dessert, but we order it anyway. The sweet potato beignets come drizzled with a honey and ginger sauce. These are not light and fluffy as you may expect. 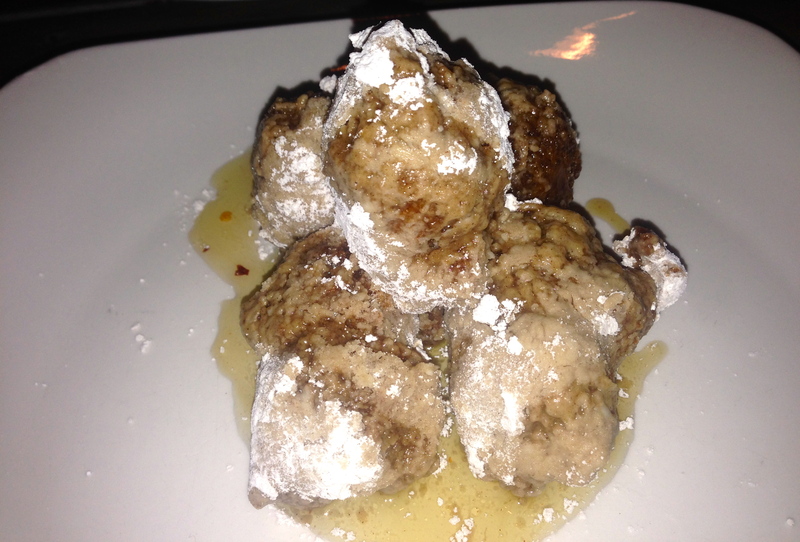 They are rather dense and remind us of bread pudding balls. Tasty, but don’t expect what you get in New Orleans. We take a couple of them home for dessert the next day. 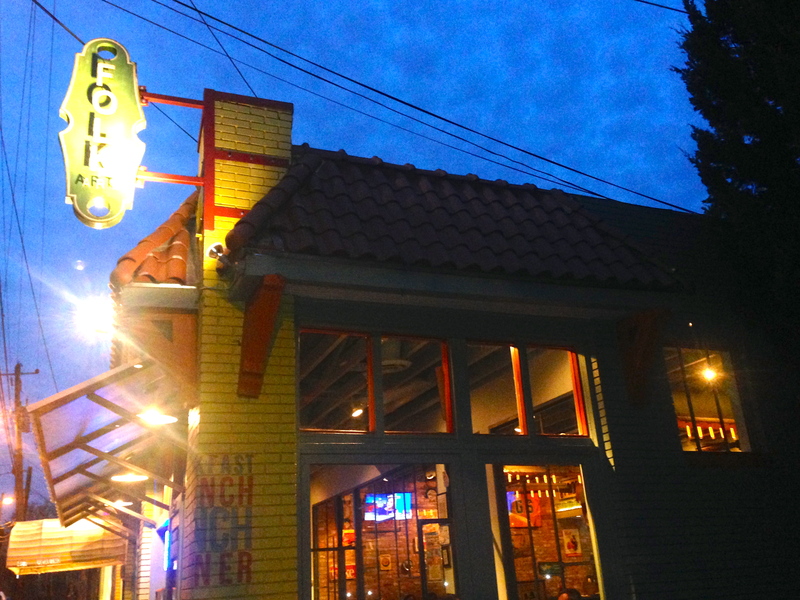 The Bottom Line on Folk Art: We had a fun, laid-back meal here. As you can see below, it’s a favorite on Urbanspoon. The service was really fast, because they draw a big crowd on the weekends and need to get the food out quickly. It’s probably better suited for breakfast, brunch or lunch, but if you need a quick sandwich and a beer for dinner, duck on into Folk Art and see what’s on the menu.